Last week, Thijs wrote a post on headings and taglines. Following that post, I’d like to elaborate a bit on focus, but now related to your branding. In this post, I’ll tell you my point of view on how to incorporate consistent branding in your website and how this can contribute to improving your click through rate from Google. What is this branding you are talking about? Branding is the way you promote your brand or sometimes simply your website name (the brand of your website) to your visitors. Branding is the new link building. A while ago, Joost wrote a post on branding and homepages as an addition to my statement that a homepage shouldn’t be used to rank a keyword. I still kinda feel that way. I do think your homepage should, without the requirement of optimization, rank for your brand. This is quite often (among others) the result of links to your website using your brand as the anchor text for that link. Our new website, coming to you this fall, is an excellent example of how consistent branding will guide you through a website and will never make you feel lost. 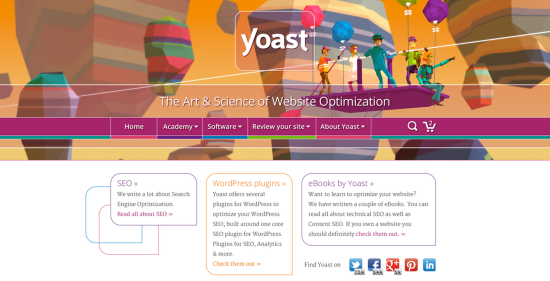 You will always, on any page and in every section of that page, know that you are visiting yoast.com. Without the use of a surplus of avatars, this time. In the new design, consistent branding is achieved by a combination of the obvious logo on every page, but also by designing every element on the website to align with that logo. There is a style guide for headings, blockquotes, lines, widgets and boxes that goes above and beyond our already pretty consistent current site design. We have the luxury of Erwin and Mijke being our ‘brand managers’ at Yoast for years, knowing the brand from head to tail. And being able to translate that brand to a design and illustrations. You might not have that luxury. In our reviews, we often find websites that are set up and maintained by the website owner himself. The ease of using content management systems like Drupal, WordPress and Joomla! are ‘to blame’ for this. That website owner might be a carpenter or dentist during daytime, and a self-proclaimed web designer by night. Apart from the question if that is the way to go (I don’t think so, every man to his own trade), consistent branding is quite often lost in the process. A general theme is used, a logo might be added – very frequently plain text is used – but that is about it. Just adding a logo is like branding a horses behind and figuring out what stable he belongs to by looking at his head. It just isn’t enough. Think about the use of colors, for instance. Make sure headings and background colors are in line with the logo colors. Make it consistent. If your logo is about curves and circles, for instance use round borders for your widgets, or a curvy heading font. Make sure it all adds up. Google bolds “WordPress SEO” as the keyword used in search when you do a search for “Yoast SEO”. It’s one of the reasons we’ll actually be rebranding the plugin to “Yoast SEO” in the near future. More on that in posts to come! Our real time content analysis will help you to add that branding to your homepage, if you’d like some assistance in that. Yes, I know. That is in a way optimizing your homepage for a keyword. Bottom line is that you need to be consistent in this. If your product is branded like Google Analytics by Yoast, use that name everywhere. It’s like writing WordPress with a lowercase P. People might take you less serious when you are not consistent in this. It will also help Google identify your branding, of course. One of the things we often tell people to do is add the brand name at the end of the page title as well. For WordPress users, adding that branding to your titles in the Titles & Metas section of our plugin is easy as pie. How does consistent branding help click through rate!? By now, you must have been going over your own website yourself and you have probably identified sections that need improvement. You need to make consistent branding a priority, which is usually the hardest part. The reason you need to make consistent branding a priority, is that when branding is consistent in page titles, in texts and in meta descriptions, all the elements of your website that are shown in Google, this will (in the not so long run), trigger recognition when a Google user searches for a specific keyword. If someone searches for WordPress SEO and ‘Yoast’ pops up every time, there must be a relation between the two, right? It will link your brand to the keyword. It will increase trust and make it easier or even more ‘natural’ for that user to click the link to your website. You will become a known source for that visitor. And that is how consistent branding will help your click through rate in Google. Recently, we have added an extra section to our intake form for our site reviews: keywords you want to rank for. We’ll allow you to add a limited set of keywords, so we can check your website for these. The one thing that stands out, is that these keywords almost never include a brand name. It’s always about the product, without the branding. That isn’t consistent at all. If you have a unique product, it should be branded. And you should optimize for a combination of [product name] and [branding], like “Yoast SEO”. Keep that in mind when choosing your keywords. And feel free to order that site review now. This post first appeared as Consistent branding increases click through rate in Google on Yoast. Whoopity Doo!